Working with APD process with ABAP routine I noticed that all key figures were equal to zero. The APD in question had regular BEx query as data source. After then an ABAP routine followed. Code in the routine wasn’t manipulating the key figures. Therefore it was a strange to me why the key figures were all equal to zero. 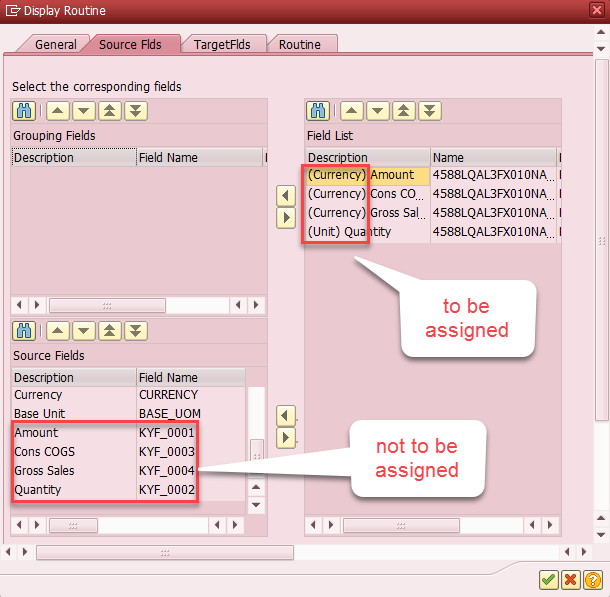 Currency or unit fields are not a standalone fields as they depend on a value field. So if just a key figure is mapped in the ABAP routine it won’t transfer real numbers so they all appear as zero. Therefore the key figures associated with the currencies or/and units have to be assigned into field list on “Source Flds” tab in the APD process’s ABAP routine.